During the dry season, elephants use their tusks to dig for water. This not only allows the elephants to survive in dry environments and when droughts strike, but also provides water for other animals that share harsh habitats. When forest elephants eat, they create gaps in the vegetation. These gaps allow new plants to grow and create pathways for other smaller animals to use. They are also one of the major ways in which trees disperse their seeds; some species rely entirely upon elephants for seed dispersal. 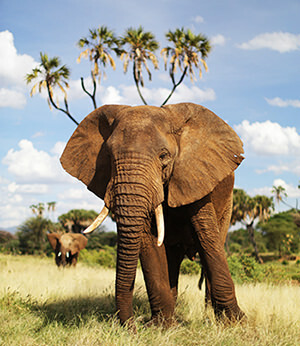 On the savannahs, elephants feeding on tree sprouts and shrubs help to keep the plains open and able to support the plains game that inhabit these ecosystems. Wherever they live, elephants leave dung that is full of seeds from the many plants they eat. When this dung is deposited the seeds are sown and grow into new grasses, bushes and trees, boosting the health of the savannah ecosystem.